Edited by Sabrblade, 14 December 2018 - 10:47 PM. It's interesting how all these different G1 Bumblebee releases over the years have had changes in just Japan and North America alone! I'm not sure any release was identical to the last. The original release was available in red in addition to yellow, with an Autobot symbol or a rubsign on the chest. Then we had G2 with the gold chrome, followed by the keychain with the remolded loop on the bumper. After that, we got the Japanese book style reissue with the new cartoon head and the rubsign replacing the sticker on the back of his head. Encore came next and had the same head and and sticker config as the previous release, but with new paint on the headlights, eyes and bumpers. Finally, this new Walmart release looks like the Encore, but it has one change; The original sticker on the back of the head has returned, replacing the rubsign. What's next for this mold? I have an old 25th Prime I messed the cab robot up on trying to mod him to hold his gun properly, so a replacement cab would be welcome, yes. 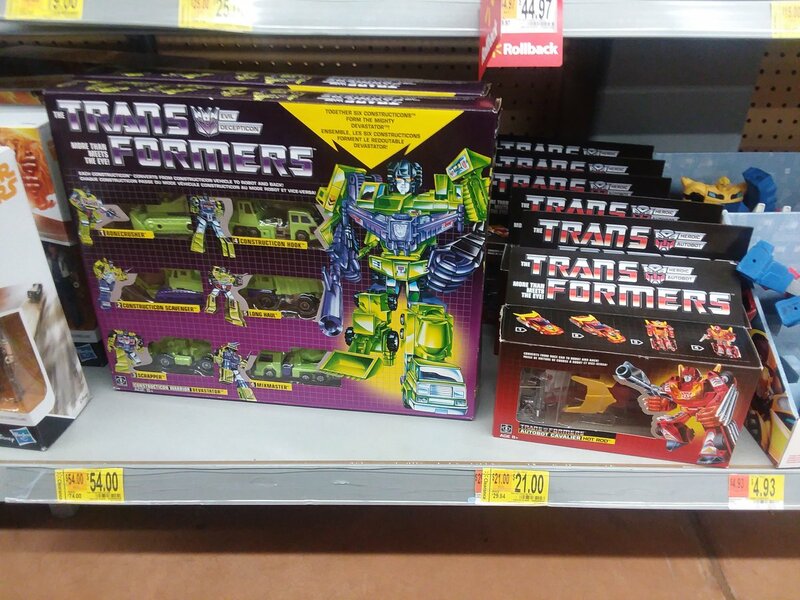 Jsut saw Devastator and Hot Rod hit clearance. It averages to nine bucks per Constructicon. I'd say that's a pretty good deal. I'd go for the $13 Hot Rod if it were available here. I never had the original as a kid (my parents wouldn't budge after getting me Rodimus Prime, because they were so similar, but variants of He-Man and TMNT were fine... wha? ), and it would be a nice addition to my collection. Edited by LBD "Nytetrayn", 29 December 2018 - 02:11 PM. He-man and TMNT were cheaper. Edited by Dake, 29 December 2018 - 07:43 PM. Already on clearance? I still haven't seen the minibots. That's not a bad price for Devastator, but I didn't like the green in person and I prefer the G2 colors anyway. Look for a Bumblebee movie cardboard display back in the electronics section, that's where I found the mini-bots. If that was their reasoning, I don't think they ever said as much. They seemed more convinced "it's the same toy" as much as Targetmadter Kup was to the original. I must say, even for a toy that's been reissued about 6 times in the last 15 years... it looks especially good in the original packaging style. Yeah this looks like it might not be based on Soundblaster. Is that a first for a reissue? Edit: Looks like the Linkin Park one went back to the single door? But that was gold colored only. Edited by Msol, 02 January 2019 - 10:37 AM. I've always thought the Soundblaster double thick chest drawer was really ugly, so if this is actually back to the original chest I'm in. -ZacWilliam, not sticking out and looking crappy beats holding two cassettes for me. Edited by ZacWilliam1, 02 January 2019 - 10:37 AM. I have all the Soundwave and Soundblaster reissues, about half both loose and in box. Even still, I want this for the huge nostalgia factor. Encore Soundblaster and Twincast remain my all time favorite MISB figures (I have them loose too) because the presentation is so nice. The Wiki says that the 08 Universe reissue has the single door.